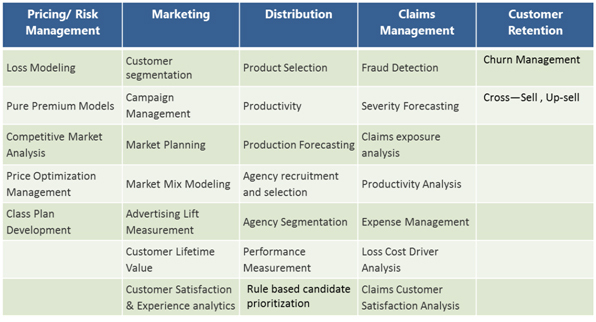 Kloutix offers comprehensive analytical capabilities in the insurance industry. The rise of social media is yet again redefining the customer expectation in the entire insurance value chain. The customers are increasingly demanding simplicity, transparency and speed in their transactions with businesses, including insurance agents/advisers and carriers. Historically, the insurance sector has used, primarily, internal data in a structured format to make tactical and operational decisions around which customers to target, how to price the risk, how to estimate the losses, etc. However, in the next decade the industry will increasingly use large amounts of real-time sensor data, unstructured data from social networks, and multimedia data such as text, voice and video. As sophisticated artificial intelligence techniques evolve, insurers will start using this unstructured data for forward-looking strategic decisions such as, which product or solution is most suited for a client given their current and future situation, which emerging countries to enter as well as when and how proactively to manage customer experience to enhance retention of the most profitable customers. Insurers who are able to use real-time ‘big data’ and advanced forward-looking simulation techniques will establish a significant competitive advantage. Kloutix has capabilities in Insurance industry across the value chain of customer acquisition, customer retention, customer growth, claims management, risk and pricing analytics. All these across channels of social media, agents, online etc.